Written by Tianna DuPont, WSU Extension. Updated January, 2019. After the severe fire blight outbreak in 2018 it is particularly important to remove fire blight cankers this winter. They will be the source of the disease in 2019. Where does Fire Blight Come from? 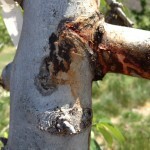 Fire blight canker bleeding in spring. 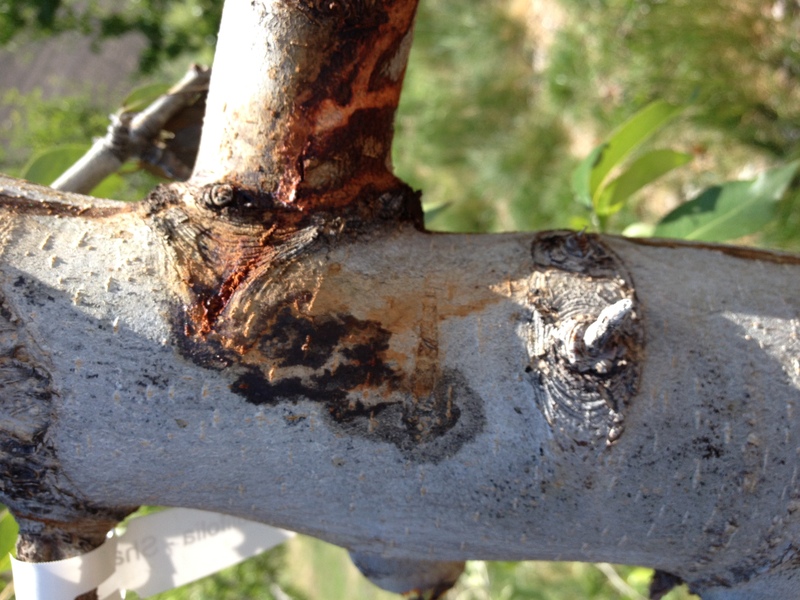 Erwinia amylovora, the fire blight pathogen, overwinters in cankers in the orchard. 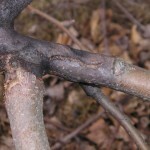 Bacteria overwinter in living tissue surrounding cankers formed at the base of spurs or shoots killed the previous season. Cankers will also form where cuts were made to remove infected shoots during the growing season. Cells of the Erwinia pathogen survive primarily in the canker margins where diseased bark tissue meets healthy bark tissue. Frequently, the pathogen inside many of these cankers dies out over the course of the winter, but in 20% to 50% of cankers active cells of the pathogen survive until the next bloom period. In spring, during periods of high humidity, the pathogen oozes out of the canker margins. This ooze is attractive to insects (e.g., flies) as a food source who then move the infectious ooze to the flowers. Fire blight cankers are considered annual cankers. While the canker itself is not likely to move further the ooze in the spring is the source for new infections. What do Fire Blight Cankers Look Like? Overwintering canker. 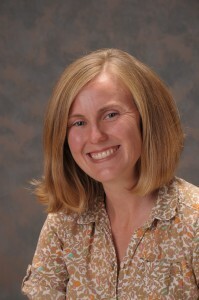 Photo credit Mark Longstroth, Michigan State University. Cankers are areas of dead tissue. There are other types of cankers, but fire blight cankers are reasonably easy to identify. They are greyish, lavender-ish, and sometimes almost black. The tissue may be somewhat sunken and cracked. The cankers are associated with shoots that were killed last year. In the tissue of young shoots, the blight moves quickly through the tissue and down to a larger stem. 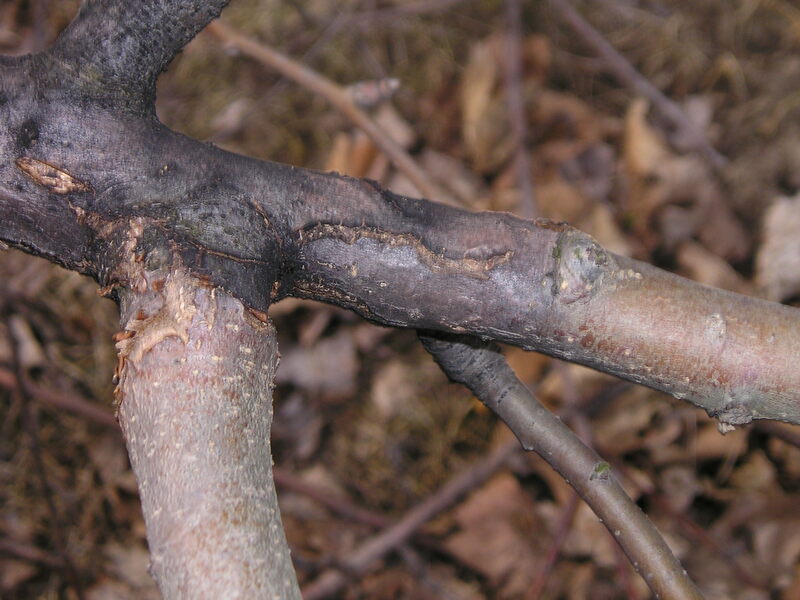 It is best to prune the cankers before the tree is shaped for structure, and remove the blighted prunings from the orchard as they can be a source of pathogen cells in spring. Compared to cuts made in summer, winter removal cuts can be made closer to the visible canker edge because the pathogen is confined to the cankered area. Cut at the next “horticulturally sensible” site below the canker. Focus your efforts in blocks where you had fire blight last year. But after a year like this one it is best to check all of your blocks. Fruit Matters articles may only be republished with prior author permission © Washington State University. Republished articles with permission must include: “Originally published by Washington State Tree Fruit Extension Fruit Matters at treefruit.wsu.edu” along with author(s) name, and a link to the original article.